Rescuers and search parties scoured central Japan as the death toll from the worst typhoon to hit the country in seven years climbed to 26, adding more misery to a nation still reeling from its catastrophic tsunami six months ago. Rescuers and search parties scoured central Japan on Monday as the death toll from the worst typhoon to hit the country in seven years climbed to 26, adding more misery to a nation still reeling from its catastrophic tsunami six months ago. Typhoon Talas, which was later downgraded to a tropical storm, lashed coastal areas with destructive winds and record-setting rains over the weekend before moving offshore into the Sea of Japan. Brad Towle, a Canadian who has lived in Japan for several years and is now working for a local tourism authority in Wakayama prefecture, told CBC's Craig Dale that Typhoon Talas had a personal impact on him: He lost a colleague and friend. Towle, originally from Gilbert Plains, Man., said he was stranded in the mountains on the weekend. But after finally leaving and enduring treacherous driving conditions on the only road open, he returned to his office to discover the woman in her 20s was missing. He learned that the woman died in the town of Nachi-Katsuura, where her father is the mayor. Before she went missing, her boyfriend had arrived in the town to ask her father's permission to marry — and he had given his approval. The mayor's wife is also reportedly missing. Towle also describes the dangerous weather he has experienced since Talas has been lashing western and central Japan. "It was incredible the amount of rain. It just kept raining and raining and raining." After leaving the mountains, there was only one road available, but "half of the road was washed away in some places. It was a little nerve-wracking." In addition to the 26 dead and 52 missing, thousands were stranded as the typhoon washed out bridges, railways and roads. The scenes of destruction from the typhoon were another unwelcome reminder of Japan's vulnerability to the forces of nature as the country tries to recover from the March 11 earthquake and tsunami. In one of his first acts in office, Prime Minister Yoshihiko Noda — sworn in just one day before the storm made landfall — vowed the government would provide as much assistance as quickly as it could. His predecessor, Naoto Kan, was forced out in large part because of public anger over the response to the tsunami, which left nearly 21,000 people dead or missing and touched off a nuclear crisis. "We will do everything we can to rescue people and search for the missing," Noda said. 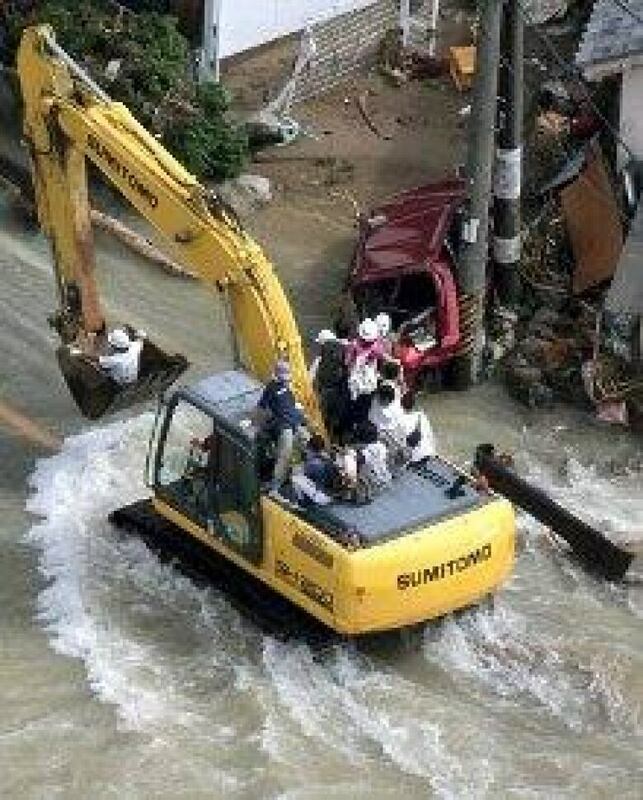 The typhoon was believed to be the worst to hit Japan since 2004, when 98 people were killed or reported missing. It caused most of its damage on the Kii Peninsula, in central Japan southwest of Tokyo and hundreds of kilometres from the country's tsunami-ravaged northeastern coast. The extent of damage from the typhoon was still emerging Monday. Television footage showed washed-out train bridges, whole neighbourhoods inundated by swollen rivers and police using rope to pull frightened survivors out of homes awash in the murky waters. The government's emergency headquarters put the death toll at 26 as of Monday morning. Evacuation advisories remained in place for about 100,000 people, although the storm itself was no longer over land. 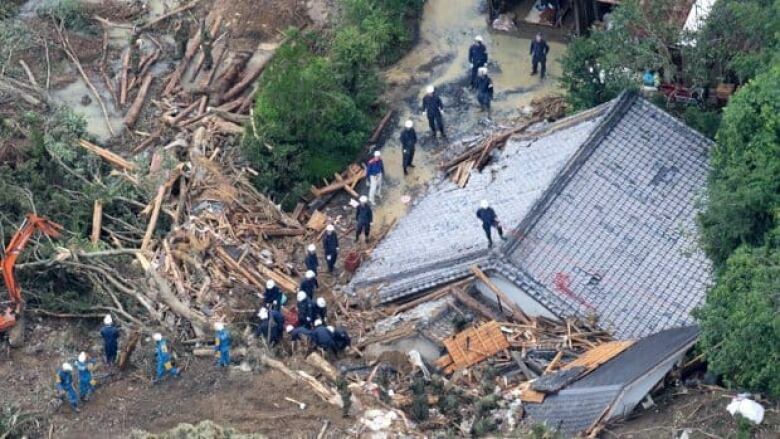 Most of the dead were in Wakayama prefecture, said local official Seiji Yamamoto. He said 17 were killed there and another 28 missing. "There are so many roads out that it is hard to count them all," he said. "Hundreds of homes have been flooded." Rains and wind were recorded across wide swaths of Japan's main island, but no significant damage was reported in the tsunami-ravaged northeast. As the typhoon approached, evacuation orders or advisories were issued to 460,000 people. At least 3,600 people were still stranded by flooded rivers, landslides and collapsed bridges that were hampering rescue efforts, Kyodo reported. The centre of the season's 12th typhoon crossed the southern island of Shikoku and the central part of the main island of Honshu overnight Saturday. It then moved slowly north across the Sea of Japan off the country's west coast, the Japan Meteorological Agency said. Talas is a word from the Philippines that means "sharpness."